In the event of a spill, you need to act fast. 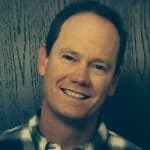 But you don’t just need the right absorbents for the job — you also need the right equipment and safety gear, you need to know how to use them, and you need to know where to find all these things quickly when you need them. Does that sound overwhelming? Don’t worry! You don’t need to be a spill cleanup expert to be well prepared for accidents. All you need is an all-in-one spill kit. These kits usually include absorbents, safety gear like goggles and gloves, bags for the disposal of used absorbents, and instructions for their use. 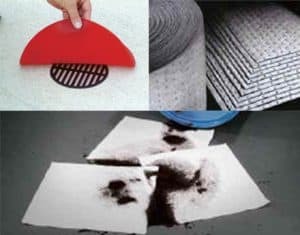 An all-in-one spill kit is designed to have everything you need to clean up a spill of any kind, whether in your home or workplace. Having one — or even a few so there’s always one close at hand — means you’re always ready to tackle any spill. Depending on which liquids you have and may need to clean up, different types of kits are available. Universal or general-purpose spill kits, which are usually gray in color, are appropriate for water-based spills as well as hydrocarbons. Oil-only kits, which are white, repel water while absorbing hydrocarbons like oil, gasoline, and diesel. If you’re dealing with aggressive fluids like acids and solvents, a hazmat kit, which generally includes yellow absorbents, is a must for safe cleanup. There are even specialty spill kits available, in case you’re dealing with potentially dangerous fluids like battery acid or mercury. Once you’ve decided which type of kit is best for your situation, it’s time to select a size. All-in-one spill kits come in a wide variety of sizes so you don’t need to try and tackle a small spill with an oversized kit — or tackle a large spill without adequate absorbents. Once you’ve determined what your maximum potential spill volume is, you can select the perfect-sized spill kit to prepare you for it. Small kits are great for mobile applications or for spaces where your potential spills will be small. For example, an economy portable spill kit is perfect to keep in a vehicle, camper, or to tuck into convenient places around your facility or home for quick cleanups. Or, if you want something a little more heavy-duty, a duffle bag spill cleanup kit is easy to bring along if you’re moving from place to place. It has convenient straps so you can hang it on equipment or wall hooks near potential spill sites. 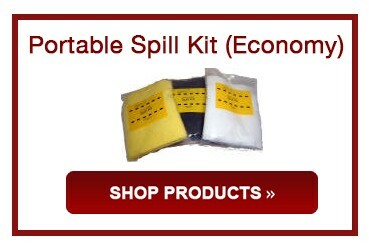 For larger spills, drum spill kits are great options. These kits come in chemical- and water-resistant drums that are easy to store on a shelf or in a cabinet. Best of all, they’re available in everything from 20 gallon to 95 gallon size, so you can pick the drum spill kit that best suits your needs. If you may be dealing with very large volume spills, a mobile spill cart might be the best solution. These carts are wheeled so you can easily move them to spill sites and are bright yellow to make them easy to find in case of emergency. If your home, garage, or facility requires something specific, you don’t have to go with “good enough” — you can work with an absorbent expert to build a custom spill kit based on your needs. At AbsorbentsOnline, we would love to work with you to provide the right spill kits to make sure you’re prepared for anything! 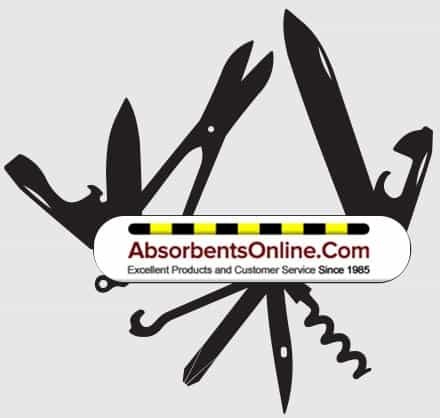 Ready to set up your first auto-shipment of absorbents and save 10% on every order? Contact our sales team at sales@absorbentsonline.com or (800) 869-9633.